Along the road past Stari Grad international airport, some new signs sprang up last summer, not so much giving directions, but indicating interesting things to look at. Very helpful! And that was how we finally noticed the largest trim I’ve yet seen, tucked away behind some trees, its weathered stone walls looking so natural in the landscape. 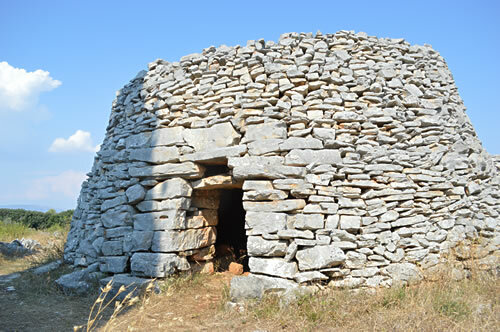 “Veli Trim” would translate to “Great Trim”, this being the XXL size of a traditional Hvar field shelter, with its dry stone walls and corbelled roof. 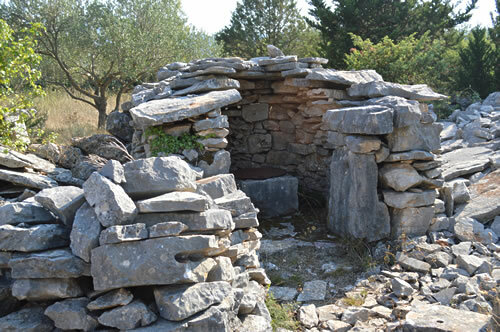 As I’ve mentioned before in a previous article (Trims – the Stone Huts of Hvar), this kind of construction appears in many places around the Mediterranean and as far north as the British Isles. This trim is in fine shape, rather well preserved. We must have driven past here so many times – how did we not see something this BIG? I’ve seen smaller churches! There are steps up the back, providing roof access for drying fruit, etc. I’m not sure about the function of the second heap of stones there, unless it was just a holding pile for building supplies? This looks to be a complex with several buildings, must have been an important farmstead. 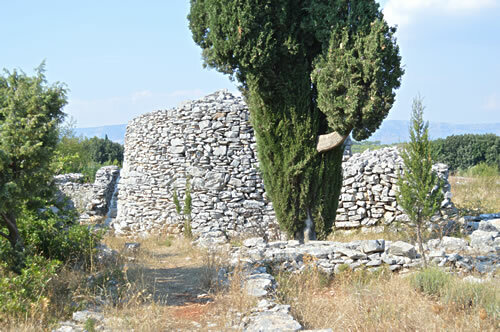 On the left, a smaller trim, not so well preserved, covers a water cistern. I recognise the square stone block with its metal lid, where you’d lower the bucket to get the water. I have an access hatch very much like that in the corner of my art studio! The small rectangular building nearby has lost its roof. I guess it probably would have had wooden supporting beams, which have rotted away, depositing the stone slabs on the ground. I love the small window with the sun shining through it from the inside! By contrast, the roof on the trim has lasted rather better! 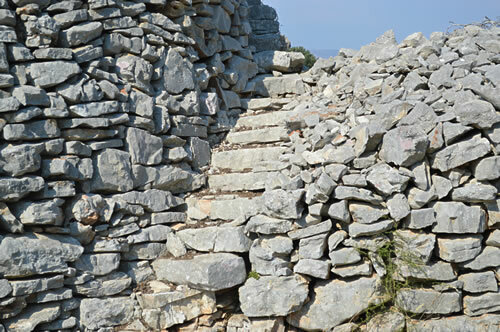 The walls are double construction, with rubble between and locking stones every so often to hold it together. The vaulted roof is a smooth progression from the walls, and the entrance is pretty impressive. 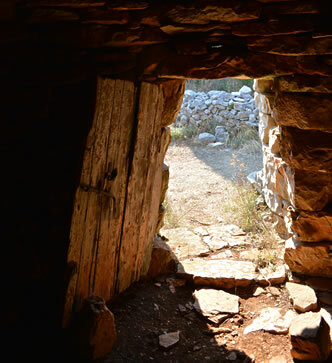 The door is on the more sheltered west side, and the large dressed stones on either side of the opening support a double lintel construction. I thought it might be to allow air to pass, but it seemed not to be open, so I don’t know. You can see the difference in the colour of the red stone inside, against the weathered grey of the same stone outside. From inside, you can see the detail of the corbelled roof. 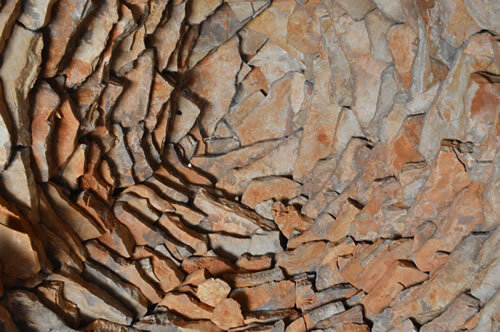 It’s simply layered in a spiral pattern, closing the hole a little more with each stone. There’s no mortar or concrete holding this dome together, and it’s not an arch with a keystone. It’s a very old way of building a domed roof, and I notice that it’s lasted longer than the house with wooden beams next door! 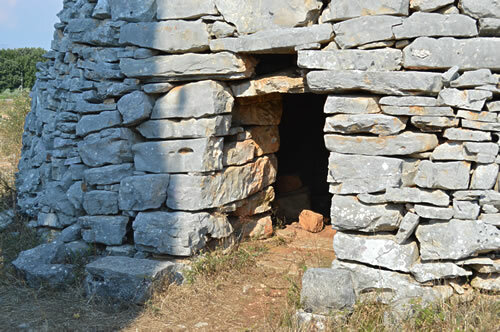 The inside has an earthen floor, though there are stone pavers at the doorstep. I notice there’s an old wooden door, too, though no sign of anything else in here. The northside has more steps leading up to the roof. It’s common to use the flat part to dry your fruit, so I assume it’s safe to climb up. The surrounding field isn’t cultivated at present, so it’s left to the imagination what this was like when it was a busy farm. 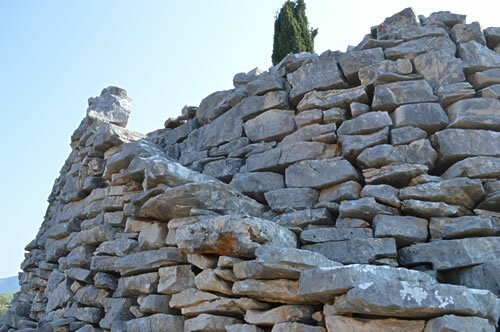 In looking for more background on trims, and similar constructions, I was delighted to find a comprehensive website that’s dedicated to preserving Croatia’s wonderful heritage of dry stone walls and to reviving the old skills. 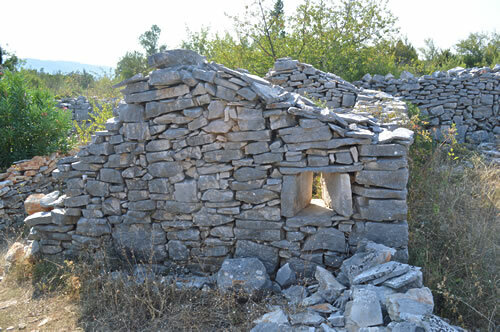 The Dragodid project is an initiative set up in 2009, which aims to protect these rural buildings before it’s too late, and to teach the construction techniques to the next generation. The recently released report on 2013 activities shows many workshops and events all round the country and abroad. 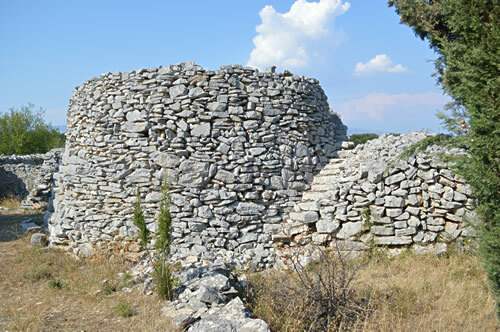 Specifically on Hvar, Dragodid volunteers have been involved in the Velo Grablje Lavender Festival for the last 3 years, demonstrating dry wall techniques. 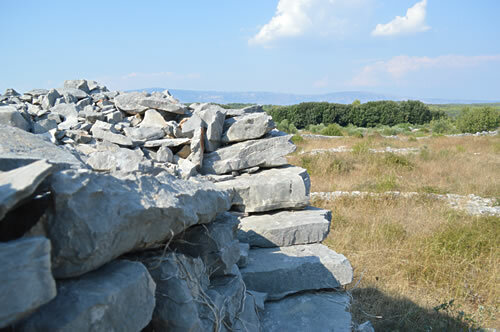 And they also held an event on the Stari Grad Plain last November with architecture students from Zagreb, cataloguing the dry stone wall objects, and adding them to the interactive suhozid.hr map… bringing me neatly back to our Veli Trim, which they marked on the map! See if you can find it! !